Weighing in at 600 pages, this book is extraordinary value for money. It took me a while to read; not just because of the length of the book, but because the material contained within its covers is thorough and involved. The Devil is in the detail, it is said, and Robert Hastings has decided to publish just as much detail as he can. It's a strategy that works. You need detail when assessing written and verbal UFO reports, and, when looking at the proposed tie-in with nuclear missile bases, the reports need to be very sound indeed. "Using the site's search radar, [Airman 2nd Class Walter] Lyons tracked the inbound target flying an average speed of 6,200 mph for 48 seconds. It then "stopped abruptly" and "remained stationary" for 12 seconds, about 85 miles ENE of the radar site. The hush-hush mentality prevalent at these sites is sometimes ordered, and sometimes self-induced. It's not until many years later when the witnesses to these extraordinary encounters feel comfortable to come forward and report them publicly. It is to Robert Hastings' credit that he has compiled such an excellent dossier. He is a determined researcher whose perseverance is admirable. He often successfully chases up leads along trails that have grown as cold as the winters around the missile silos of Montana. It is no mean task. A book of 600 pages is inevitably going to cover a lot of material. Set out roughly chronologically, 'UFOs and Nukes' moves through the decades, through the hay-days of UFOs in the late 40s, 50s and 60s, to the present day. Connections with Roswell are discussed (the military base near Roswell was the 509th bomber group, the world's only nuclear weapon bomber squadron, which is surely not a coincidence), as well as the almost-as-remarkable Rendlesham Forest incident (where the airspace over a nuclear weapons storage area at RAF Bentwaters was allegedly compromised by a UFO). The author offers new material on both these subjects, including an excellent interview with Chet Lytle on page 510. There is also an excellent discussion of the correlation between the radioactive fallout clouds following nuclear weapons tests and the observation of green fireballs (pp65-6). This work is largely attributable to the researcher Dan Wilson, but is very usefully included in this book. I'm at a complete loss to explain this enigmatic phenomenon. There are things I would do to improve this book on an editorial level. It suffers from a lack of index, exacerbated by the fact that the chapter headings are cute rather than descriptive. Whilst the chronological layout mitigates this problem a little, there are sections of the book (like the Roswell incident) that pop up out of sequence. There are also several chapters that go off-topic, acting almost like a commercial break. They serve to highlight the author's opinions about mainstream science's attitude to UFOs, or conjecture about possible UFO propulsion systems. But in a book this long, they simply create a bulkier text. In general, I think this literary bush needs a bit more pruning. An off-shoot of reading this book is a revisitation of the fear of nuclear war. The Cold War is over, and Communism is defeated (and unfettered free-market Capitalism too, it would seem from the events of the last few weeks). We sleep safer in our beds. But perhaps we have simply become complacent. The missiles are still there, en masse. They still pose a threat to the entire planet. It is also clear that the UFO activity that has occurred over launch facilities is a warning to us that intervention by outside parties remains a constant possibility. It is our species' gamble that that intervention would probably be positive, rather than catastrophically negative. 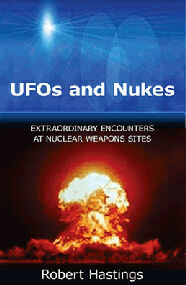 Subtitled: "Extraordinary Encounters at Nuclear Weapons Sites"